Sometimes you pass by a displayed food item in Walt Disney World and pull a double take, literally. Such was my reaction in December when, as I was minding my own business as I found something for lunch in Sunshine Seasons, I came across the Guava Cream Cheese Cupcake. While baked goods are nothing new to this corner of Epcot, this combination of flavors did seem like an unusual, but conceivably tasty, grouping. What sounds like a breakfast pairing, cream cheese and guava, turns into a simple and sweet cupcake that could be eaten any time of day (and I do think it would serve well in the place of a breakfast pastry). From the top down, this is a cupcake that has a cream cheese frosting, which is very smooth and garnished with a sprinkling of chopped nuts, and a guava preserve topping. 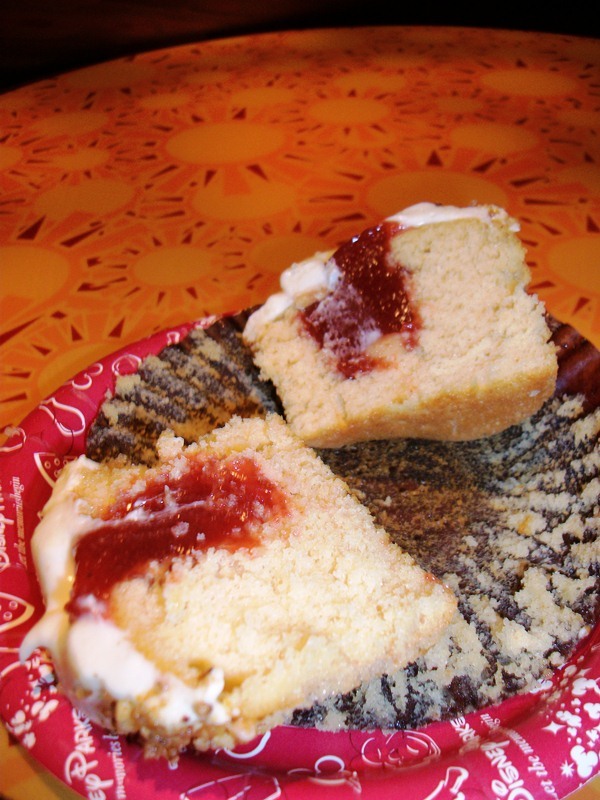 The guava is actually the core of the cupcake, as it becomes filling to the cake. As for that cake, it is clearly a yellow cake, but looks can be deceiving. 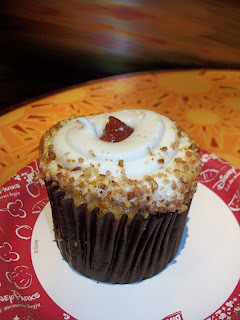 As I was told by Catherine, who had made the cupcake in the Sunshine Seasons’ bakery, both cream cheese and guava had been folded into the yellow cake batter to create a consistency of flavors across the entire cupcake. There are no two ways about it; this is a delicious cupcake, an example of the well-crafted and imaginatively designed cupcakes that have been popping up in baking pans across Walt Disney World. I love that no matter where you bite into the Guava Cream Cheese Cupcake, you are, at the very least, going to get a hint of cream cheese and guava, even if all you get in your bite is cake! Adding guava to the cake mix? Ingenious. Now I'm hungry. I had the good luck to try one of these on my last trip to WDW. It was fantastic and now I know how they got that great texture in the cake! What a great review.